If you offered me a choice between having a twelve inch catheter shoved up my urethra or using Blackboard for ten minutes, I’d choose the catheter, no questions asked. For those lucky few who don’t know what Blackboard is, it’s a course “management” “software” designed to “help” schools and universities share course materials with their students. It’s used by an estimated 3.7 million users from 37,000 clients worldwide. While perhaps not as successful a product as the catheter, Blackboard ultimately displays more inventiveness in the pursuit of human suffering. Blackboard’s main problem is that it presents four different ways to do any given task, only one of which works. For example, I recently had to create a discussion board for a unit of study I tutor. How would we do this? You could go Control Panel > Unit of Study Tools > Discussion Board, but that will only show you a list of discussions. You can’t make one from there. Instead, you can try Control Panel > Unit of Study Tools > Users and Groups > Groups > Create a group with all students > All Students Group > Group Discussion Board > Add Group Module > Group Tools > Group Discussion Board > Realise the “Group Discussion Board” button doesn’t do anything > Click it again > Fail to observe any change > Try not to cry > Cry. Googling “blackboard create discussion forum tutorial” didn’t help much. Blackboard’s official documentation told me to click a “create forum” button that wasn’t there, and probably wouldn’t have worked if it had been. All the YouTube video guides were from outdated versions of Blackboard released years ago. 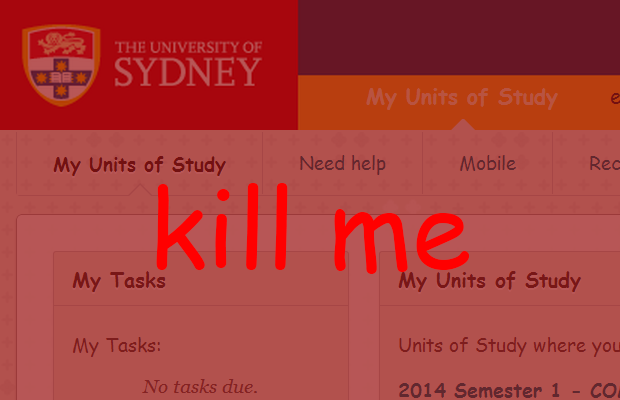 In the end, I had to call USyd’s internal support team and get a step-by-step walkthrough of the exact process. I’m in my fifth year of Bachelor of IT. How on earth are teachers without technical training supposed to figure this out? Don’t get me wrong, I’m incredibly impressed that Blackboard Inc has hired the ghost of Franz Kafka as a design consultant. If there was an award for “Software Most Akin to Walking Blindfolded Through a Hall of Mirrors While Unsettling Voices Chant the Names of Those Forgotten”, Blackboard would win it every year. And don’t forget about an array of software bugs. Like how when you mouse over a table, it says “this table is a collection of values of attributes.” Very helpful. Or when you add all students to a group, it says “All items added to a cart,” confirming my theory that Blackboard is owned by faceless aliens who don’t value human life. It’s slow, it uses frames (the Comic Sans of web development), and it breaks on mobile devices. In 2014, there is no need for software as bloated and overengineered as Blackboard. If you want to share files with students, make a Dropbox and give them a share link. For more functionality, use software like Canvas. I’ve used it in some units of study, and both teachers and students loved it. These days, Blackboard Inc. is more concerned about buying their competitors and adding new features rather than actually improving their own core product. I’d rather teach with a Dropbox, a slide deck and a catheter than touch Blackboard again.